Mohsennezhad, F. (2014). An Analysis of Heavy Metals Quantity Especially Pb, Cr and Cd in Grape and Various Leaves Types of Vitis Vinifera L. Harvested in Malekan Based on the Distance From the Road. International Journal of Advanced Biological and Biomedical Research, 2(Issue 4 (2)), 279-286. Fatemeh Mohsennezhad. "An Analysis of Heavy Metals Quantity Especially Pb, Cr and Cd in Grape and Various Leaves Types of Vitis Vinifera L. Harvested in Malekan Based on the Distance From the Road". 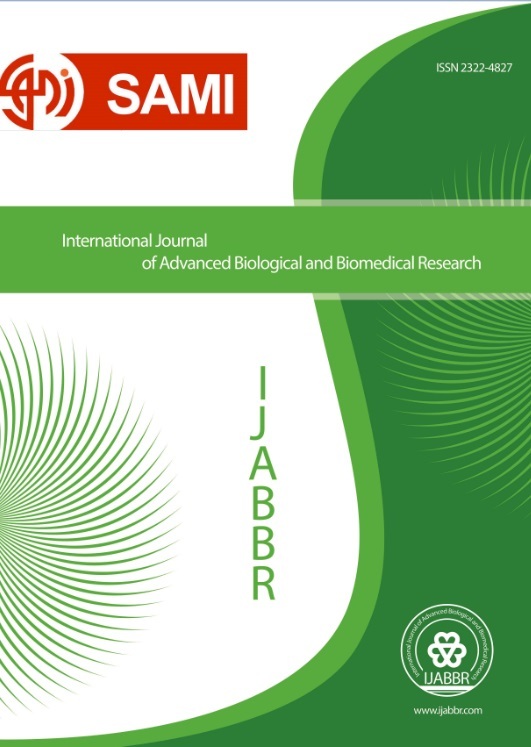 International Journal of Advanced Biological and Biomedical Research, 2, Issue 4 (2), 2014, 279-286. Mohsennezhad, F. (2014). 'An Analysis of Heavy Metals Quantity Especially Pb, Cr and Cd in Grape and Various Leaves Types of Vitis Vinifera L. Harvested in Malekan Based on the Distance From the Road', International Journal of Advanced Biological and Biomedical Research, 2(Issue 4 (2)), pp. 279-286. Mohsennezhad, F. An Analysis of Heavy Metals Quantity Especially Pb, Cr and Cd in Grape and Various Leaves Types of Vitis Vinifera L. Harvested in Malekan Based on the Distance From the Road. International Journal of Advanced Biological and Biomedical Research, 2014; 2(Issue 4 (2)): 279-286. Providing healthy food and protecting sources from pollution has been one of the concerns of human societies and decision – making centers so that protecting food from pollution, detecting sources of pollution and measuring them become important. Because of nutritive and political significance of grape in this area, extensive use of leaf and fruit of this plant, developing urban areas around grape gardens and construction of Tabriz – Miandoab road which is the most important link between East and West Azarbaijan had us to examine the impact of this road construction and urban environment pollutants such as lead chromium and cadmium on the quality of this valuable crop. Firs the samples were taken from different adjacent places and medium distances far from the road then each place located exactly by Google earth and GPS. Digestion was done through burning dry material and hydrochloric acid and their ashes were analyzed by atomic absorption and in this experiments effects of 2 factors; garden distance from the main road with levels 1: for 50meter, 2: for 120-200 meter, 3: for above 800 meter. Plant organ with levels 1: for fruit, 2:for leaves on ( Pb, Cr, Cd accumulations as a variable at the end the results processed by SPSS software. In the tested area, it became clear that, from the accumulation of heavy metals perspective, there is no meaningful difference in existing distance between road and garden. There in a meaningful difference among heavy metals accumulation. In other words increase ratio of one metal to another was different that the resulted differences are shown in corresponding graphs. Interaction among elements and distance between garden and road was not meaningful.